Classical literature; History and criticism; Theory, etc. Amazon.com description: Product Description: This collection explores the issues raised by the writing and reading of commentaries on classical Greek and Latin texts. Written primarily by practising commentators, the papers examine philosophical, narratological, and historiographical commentaries; ancient, Byzantine, and Renaissance commentary practice and theory, with special emphasis on Galen, Tzetzes, and La Cerda; the relationship between the author of the primary text, the commentary writer, and the reader; special problems posed by fragmentary and spurious texts; the role and scope of citation, selectivity, lemmatization, and revision; the practical future of commentary-writing and publication; and the way computers are changing the shape of the classical commentary. With a genesis in discussion panels mounted in the UK in 1996 and the US in 1997, the volume continues recent international dialogue on the genre and future of commentaries. 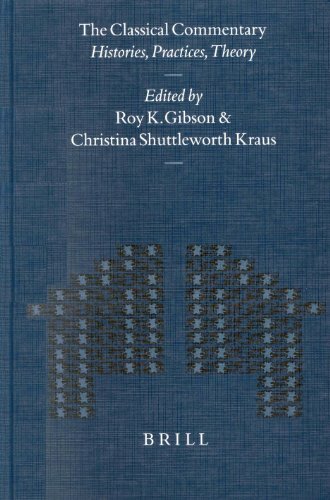 About: This collection explores the issues raised by the writing and reading of commentaries on classical Greek and Latin texts.